Usually when a Metal band (specifically Death metal) delves into history for an album, they tend to busy themselves with the likes of Viking and Nordic epics. 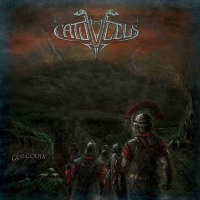 Not so with French-Canadian band CATUVOLCUS though, “Gergovia” is a concept album based around one of the most famous battles of the Gallic War. They have focused on the history of Gaul in all their releases (one full length “Vae Victis”, and one EP “Terres De Sang”), and I suppose they’ve found their niche, as this era in time apparently produces some very good music. There are a lot of layers to this album, and they’re not all visible on your first listen through. There’s all these little subtleties that gradually reveal themselves – a riff that takes you by surprise, or a particularly savage bit of vocals – for a Metal album, it’s pretty sophisticated. The vocals are most definitely Death Metal, perhaps in fitting with the time period chosen, they are very savage and wildman-esque, but they’re not completely unrestrained, the talent on display is very visible. The album has a very nice acoustic epilogue and prologue, beginning and ending in a very calming way, especially considering the assault on your eardrums bit in the middle. The song lengths do vary quite a bit, but the album never feels disjointed, and all flows together very well. And if you take into account that, in its entirety, “Gergovia” is almost an hour long, it certainly doesn’t feel like that, hence why I was more than happy to give it repeated listening. I never really felt like I was sat there, twiddling my thumbs, waiting for it to end. And now more the more technical side of the album. We’ve got some very good musicians here. The guitar and bass work from Cote and Tveskaeg is fast and frantic and, most importantly, heavy. The drumming surges, and stands out on every single track, which is testament to the quality of them, because you’re never wishing that they weren’t there. Plessix’s vocals, as I’ve already mentioned, are absolutely brilliant. For the most part, he does the Death Metal vocals, but he does do some clean vocals, which only serve to highlight what range he possesses. My favourite riff shows up in “A La Poursuite Des Vents”, it’s very catchy, and makes the song very enjoyable. But really, all of the songs are outstanding, and this album has a great consistency that you don’t always find in modern Metal albums. No, it’s not a completely perfect album, but there’s a heck of a lot of ups here compared to the downs. So if you want something with a slightly different historical twist that you might be used to, you should definitely check out “Gergovia”. And if you’re just looking for a good old fashioned Metal album, you should still check it out – I think you’ll be impressed.